Nice and soft fabric. My son loves it. Take a walk into the Jurassic Age with the Sharp Tooth Coverlet Set. 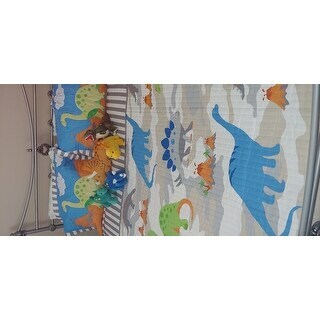 Erupting volcanoes, brontosaurus, stegosaurus and a mountainous backdrop provides a fun atmosphere for the bedroom. The sham features plush fabric for a fun way to add dimension to the top of bed while a plush dinosaur pillow adds a decorative yet comfortable accessory to complete this look. This quilt is amazing! It is incredibly soft, and the colors are bright and crisp. The pleats are subtle. The reverse side has gray and white vertical stripes, about 1 inch wide (like the sham border). It is a little thinner that I anticipated, but honestly I think that's ideal because it'll be perfect for summer. In winter, I'll just provide an extra blanket. Our daughter gives it five stars! She said, "It's really nice. Kind of like a quilt and the dinosaurs are appliquéd on. They are soft but a different kind of fabric; almost fuzzy. It definitely feels like it will hold up in the washing machine. The pillow sham is the same way and the throw pillow is basically a stuffed animal. It's good, quality stuff!" Since we recently moved across country from them, it's good to know that O-stock can be trusted to send good quality merchandise. This is not the first time I've ordered from O-stock, but every time, I've been pleased with the resulting order. Thank-you, Overstock! I purchased this item over 3 years ago. It has held up to a toddler. The colors are vibrant and the construction is superb. The quality is excellent. The underside of the coverlet has wide gray and white stripes which is also nice. Great to have a decorative pillow as well as the sham that came in the set. Be careful pulling the tag on the dino, its a strong tag sewed in the seam - when I pulled it tore open the seam and I had to mend. I should've cut it. ...the grey stripes on the back are a nice accent and looks good reversed as well. The grey is a cool grey, the tan/camel color is more of a true camel than an orange--just FYI and the green is a Granny Smith Apple, the blue is the exact same color as blue painters tape (so is the green--Frog Tape). 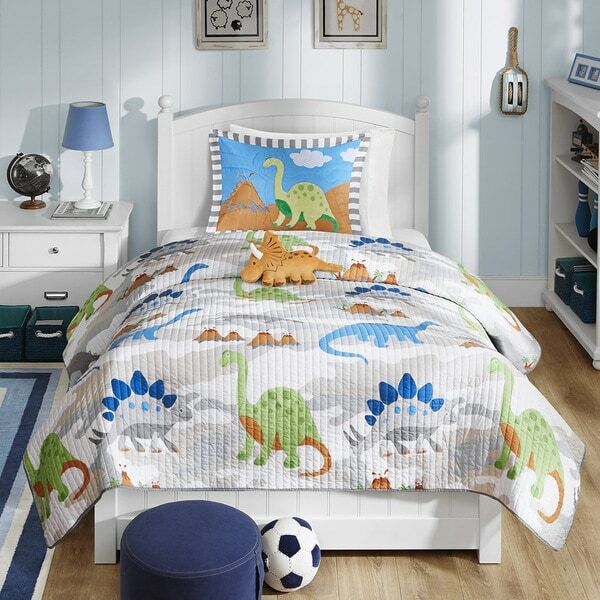 It's hard to find kids' bedding in full/queen sizes, not to mention dinosaur bedding. I love that we can reverse the quilt and that it's wide enough to overhang the sides of the bed without the sheets showing underneath. 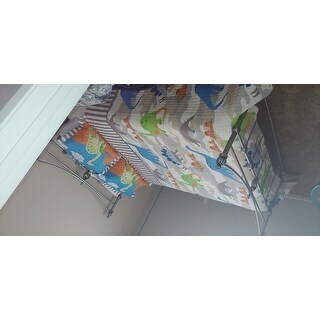 My grandson loves this coverlet. It is light and bright and makes his room very happy! It is a great quality for the price. If you kids like dinosaurs they will love this quilt! I bought this in twin and full for my son’s bunk bed. I am very satisfied with the quality and the print. It looks amazing in his room and holds up very well to washing. I would recommend this product and would purchase again without hesitation. Grandsons really liked this set and the dino pillow was a big hit. Soft fabric with a colorful design. “This quilt is great! It’s keeps me the perfect temperature. I like the silk soft feel and I love my Dino pillow!” From a moms point it’s a great quilt and I washed up great. It’s not a 100% cotton like I wanted but the filling is. He likes it and that’s all that matters. I love that it came with the little Dino pillow! Absolutely Adorable! I bought for my sons room he loves it. Great quality and looks. Ice not cheap at all. Just what I was going for. This was a really quality and good weight. My boys loved the dinosaur pattern. It was definitely a hit at our house! I Love it, and so does my son! It is so cute and not too heavy. looks great in his room with the rest of his décor! Super cute. Still decorating my grandsons room at our home. He's 2 and loves dinosaurs. My daughter viewed pics and totally approves! Grandson will love his bed and sleepover more often! omg. love it. will buy one more for my baby. We needed to freshen up my son's room and the second we saw this set, we were in love! I'm not a huge fan of comforters, as they are so bulky and we live in South Texas. So when I saw this quilt I thought it was perfect. It has kept its shape through many washes and is very durable. Doesn't bulk up when washed either. Very pretty,colors are true to what you see on the website.It is soft but a few of the threads have come loose.Beautiful quilt nonetheless,my toddler seems to like and we use it sometime to teach him the dinosaur names.I would definitely buy this brand again. "What color is the underside of this coverlet? " The underside is solid grey. For my sons bed. He picked the set out himself. We chose a bold blue full-sized bed for our almost four-year old son. As a compliment to the dark bed, and to lighten up the feel of the room a bit, we chose this fun and colorful coverlet with a soft white/grey base.